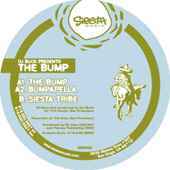 Dj Buck The Bump is a funky tribal house record with a slightly jazzy feel. Side A plays at 33 rpm. A1 The Bump opens with funky guitar licks and disco hand claps, soon the bassline and bongos follow. The vocal and effects fill out the music before the main groove begins after a brief breakdown. A2 Bumpapella is simply the vocal with some effects and a hi hat. Side B Siesta Tribe begins with tribal percussion and disco hand claps, before building up with the main beat. Some jazzy keys and an ethnic voice sample is heard before getting into the main groove and melody. The track is largely tribal house in nature but the jazzy keys and flourishes oddly makes this a chilled experience. This maybe not Dj Bucks finest moment but it is certainly not his worst either. Buck gives us psychedelic funky guitars and bass and drums to die for. Bumpin'.